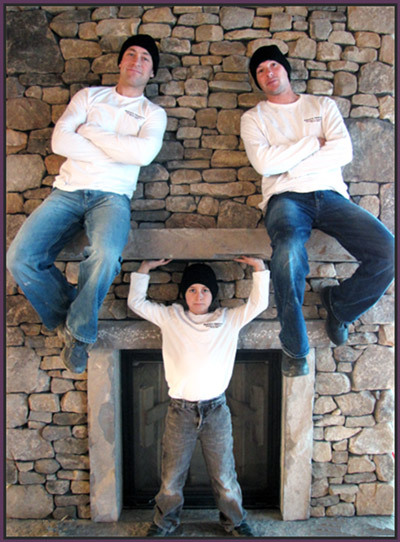 Steve's Masonry is a team of master stone masons, well respected and sought after for their custom interior and exterior stone work as well as one-of-a-kind fireplaces. We will exceed your expectations in achieving unique results in building projects of any scale. Steve's Masonry has served the builders and home owners of Collingwood, Blue Mountain and surrounding area since 2004 with commitment to providing the highest quality stone work and customer service for our clients. PUT OUR TEAM'S PASSION TO WORK FOR YOU! I grew up on Cape Breton Island, where the raw beauty of nature is around you constantly, from the pounding surf of the Atlantic to its highlands. As far back as I can remember I have been fascinated by stone, above all the colors and textures, the permanence and the rocky shores of the ocean which have been pounded for thousands of years, getting more beautiful as time passes. Over the years I was intrigued by the fact that the main building material in the world's architecture, until very recently, was stone. From the incredible building feats of the Egyptians to the brilliant sculptures of the Italians and of course the medieval castles of early Europe with their underground tunnels and hidden doorways, I realized there were limitless possibilities in working with stone. So at fifteen I began an apprenticeship during the summer months. I gained valuable experience in every aspect of masonry, spending time doing restorations on historic older buildings, exploring the commercial side and learning about the structural aspects of masonry. I built many fireplaces and covered thousands of square feet with this ultimate building material - stone. It was during those years I developed my passion. I look at stone work as art work and my clients houses as a canvas. I love the beginning of a job when I get a chance to talk to the client and find out what kind of picture they have in their mind and the colors they envision. I enjoy locating the right stone for the job, and getting to work on a new project. I love to see the look on our client's faces as they see that we took their desires into account and combined it with our expertise to create beauty which will last a lifetime. Since 2004 we have built up a solid reputation based on quality and dependability. Our custom stone work has been described as "a lost art", and our fireplaces as "one of a kind". I have invested time and resources into the company and as a result have all the equipment and skilled people necessary to complete any size job. We are always on time and often finish ahead of schedule. Our crew is trained properly, are always professional and are working in this trade because they share the same passion I have. Stone mason Erik Wood has been with Steve's Masonry since 2005. Erik and Steve's unique tastes and styles have blended very well into a successful partnership. Erik has laid stone on such jobs as the Osler Brook Golf and Country Club and all the fine homes Steve's Masonry has completed in the Georgian Bay Club estates. His creativity and attention to detail has earned him a respected position with the company. Erik will complete the final in-class portion of his apprenticeship at Conestoga College's 2011/12 winter semester to earn certification as a licensed mason. In both his first and second years at college, he ranked first in his class in marks as well as projects, winning awards and cash bonuses for his efforts. Erik has found his passion for working with stone, and has become 'a student of the art'. Steve's son Tristin appears in the team picture as well. He has helped his dad on some projects where appropriate, and is developing quite an eye. He can already critique stone work he sees around him. Tristin will begin his apprenticeship at sixteen. His dad wonders if the irresistable draw of building with stone will affect him as well. Will have to wait and see!